The Faim dove right in to the music industry. From working with John Feldmann, Pete Wentz, Mark Hoppus, & Josh Dun, to releasing their debut single “Saints of the Sinners ”, the four-piece band are certainly building their repertoire. 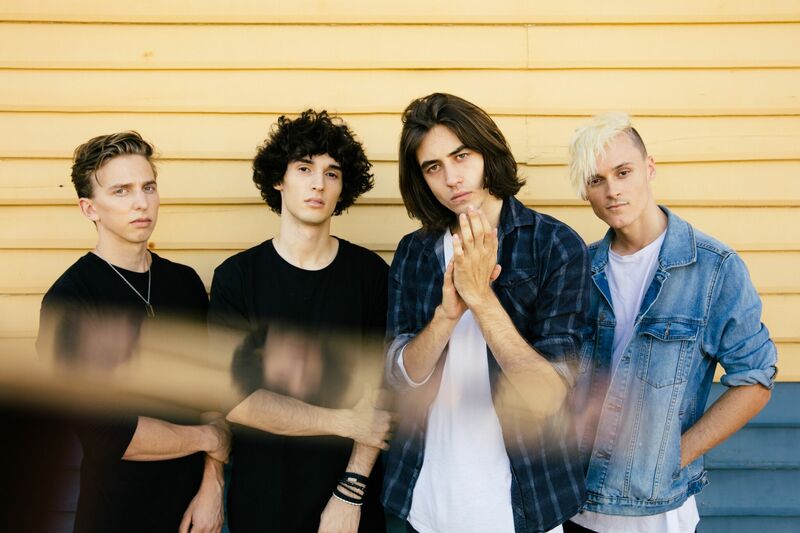 The Faim are touring the UK and Australia this year with their first international headline show in Glasgow, Scotland on May 25. The band has plans to tour the U.S., hopefully with a stop in Phoenix! No word yet. The Faim (formerly Small Town Heroes) is 4 years old. Where did The Faim’s band members meet each other? Michael, Stephen, and I all met at high school. We were in the same music class for a few years even though Michael was in the year above. Stephen and I had played various school performances together and Michael had started recording a few ideas with Stephen after school. We got together and decided we wanted to start a band. After about seven months of starting the band we spotted Sean on YouTube and were instantly drawn to his energy and style of playing. We had our first jam a short time later and everything just clicked. We connected more than we ever thought, and we haven’t looked back since. Have you always wanted to be musicians? Every one of us has been drawn to music. Having bands and artists who inspired us and helped us connect with music so strongly is something we want to share in our own way with others. One thing we’ve always had in common is that music has been always a release for us. Even before we started the band we all had a passion and connection to music. It was just about finding the perfect pieces of the puzzle for our journey that happened to be each of us. How did musician & producer John Feldmann hear about you? Our first contact with John came about through Instagram. He posted saying he was offering opportunities to “bands with touring experience” and we knew we had to try. We knew we had no touring experience but we were so determined to learn and give our all to impress him. We sent two of our favourite songs we had written at the time and hoped for the best. A few weeks passed and we’d put it in the back of our mind that we’d sent the email and just kept to our routine, and all of a sudden we got an email from John asking for a FaceTime call and that’s where our relationship started. Your sound has evolved from the Small Town Heroes Set Free EP. How much had it changed in between then and when you started working with Feldmann and other artists, and what inspired the change? Before we were writing with John we were struggling to find an organic sound to connect with. We wanted to be authentic, unique and connect with people on a personal level. Those writing trips really opened our perspective on writing music. The pressure was so intense, but we all were so determined to find our identity and explore our writing process. Opening up so personally with each other and just talking about what we wanted out of the core of each song was a huge part of the learning process. Within the first 10 minutes of meeting John he was already pushing out of our comfort zone. Putting us on the spot to perform songs we’d finished on the plane. The experience, the energy, and our open perspectives on music helped us open the doors to finding our identity of sound amongst all of our passions and influences. As a young band, how does it feel to already be working with musicians from huge bands such as Goldfinger, Blink-182, Fall Out Boy, and Twenty One Pilots? We were star-struck at first. We couldn’t believe we were writing with the musicians who not only inspired us in a songwriting perspective but the story and the message behind it resonated with us. Having the opportunity to not only write, but get to learn from and relate to them as people was truly inspiring. Especially because they were all such down-to-earth, talented musicians who really love creating great music. Was there influence or advice from these artists that was a game changer for you? A game changer for us was John really influencing us to be more critical on letting ideas flow naturally. If we weren’t liking a melody or lyrics after 10 minutes we’d move on. Being definitive, honest, critical and persistent was a world John really opened us up to. You can hear co-writer Pete Wentz’s influence in “Saints of the Sinners”. What role did he play in collaboration? Did he write arrangements, lyrics, or something else? Does “Saints of the Sinners” theme of perseverance to have your voice heard come from your personal experience in pursuing your music career? Definitely. I feel like any creative person feels that burning sense of frustration when plans or songs you create don’t turn out how you expected. This song is a response to any obstacle or environment that holds you and your dreams back. When your dream becomes a need there’s a passion to take control. Coming to terms with the reality that it’s your right to not only work towards but to take what you deserve. What kind of setbacks helped shape you into the musicians you are today? There’s been countless amounts of technical difficulties, fights, sleepless weeks, the list is endless. A big hurdle we faced was everyone dropping all their commitments and becoming a living, breathing band 24/7. It was financially crippling, inevitably frustrating and unpredictable but we wanted to develop our establish our identity, our sound and we knew that’s what we had to do. Every single one of these setbacks has had a part in shaping us as musicians. Setbacks were our biggest enemy but also our greatest ally. Being able to learn from these mistakes and push through every obstacle makes you not just stronger in your craft but a stronger person. Do you have any advice for aspiring artists to keep going? Create music you enjoy and relate to. Take extra time to get to know the people who listen to your music, and go the extra mile to being a good role model. If you’re authentic to who you are, then it’s never a quick process finding your identity. Stay open to perspective and learn from criticism. Then, you have the first steps to move forward. If you could play a show anywhere in the world, where would you choose and why? We all have dreams of playing Madison Square Garden and Wembley Stadium, but the absolute best show would be to play right at home in Perth Arena. We’ve got so many fond memories of seeing some of our favourite bands play and having that experience to share with our hometown would be perfect. When do you guys plan on touring the U.S.? What do you know about Arizona? We have plans to come back to the U.S. to perform, but we have a very tight schedule for the upcoming months… but plans are definitely in the works. We’re all pretty new to travelling but I’ve heard beautiful things about the Arizona landscapes. It’s always been a dream of ours to experience different environments, and the waterfalls and culture of Arizona really appeal to us. If you could tour with one band or musician from any time period, living or dead, who would you choose and why? Jimi Hendrix, because his music is just undeniably incredible. There’s something so perfect about his relationship with music and how it reflects in his songs. One man with a guitar who captivates thousands in such a different time is something that really resonates. The story of his relationship with music is so inspiring, I can’t imagine how passionate his live performance must be. His connection with music is so raw and intense, and I would love to see a crowd of today connect with it.